Has there ever been a game more hyped-up than Grand Theft Auto V? Whether you’re a fan or a hater, gamer or non-believer, no matter who you are or where you are, when GTA fever kicks in, mass hysteria ensues. It’s the hottest topic on the playground, can cause a sudden and unexpected surge in illness upon release, and consistently smashes sales records into oblivion. Expectations are always astronomical when it comes to Rockstar’s world-famous sandbox series, and somehow it always manages to exceed them without breaking a sweat. That tradition remains unbroken with the latest instalment. As you’d expect, there are one or two controversy-baiting scenes which means that GTA V will be forever remembered by some for unflattering reasons, in a similar way that the infamous ‘No Russian’ mission has done for Modern Warfare 2. Elsewhere, as neat a job as it does in introducing you to the game’s overhauled mechanics and setting up the narrative ties that will be pulled later on, the prologue’s uncomfortable confinement, insistence on taking some control away from you, and overall lack of spark means your first five minutes probably aren’t quite what you had in mind. But it’s okay, because it’s only for five minutes. Besides, another ten minutes in you’ll have legally repossessed and got behind the wheel of a fast car, raced it through the sun-kissed streets of Los Santos and escaped the heat in your first police chase. Memories of the comparatively-dull opening are promptly washed away as, once you’ve picked your jaw up from the floor after marvelling at the technical wizardry Rockstar have pulled off on the current crop of consoles, it hits you: you have the entire state of San Andreas open for you to explore. There are no contrived terrorist threats or bad weather conditions to keep certain areas closed off from you this time and, once the leash is removed, you’re well and truly free to go wherever you choose, whenever it suits. Rockstar’s current-gen interpretation of the last-gen’s most famous open world is nothing short of staggering. Not only does it encompass the full-sized city of the Los Angeles-aping Los Santos, a city both large and dense enough to carry a game on its own, you also have the desert plains, rocky mountains (hello, Mount Chiliad) and forest regions of Blaine County available to you to take part in all manner of memorable story missions and extracurricular activities, not to mention the fully-mapped ocean floor. This is Rockstar’s biggest world yet, claiming to outsize GTA IV’s Liberty City, PS2-era San Andreas, and Red Dead’s Wild West combined. What’s more, there’s not a single square inch that feels like it’s been procedurally generated or heavily reuses art assets, at least if there is it never lets on. Rockstar have clearly obsessed over the sculpting of their latest work, painstakingly placing every building, every road, every spec of detail – from the weeds protruding from the ground to the furnishings of enterable buildings – in its rightful place, resulting in what could perhaps be the most credible and awe-inspiring world in all gaming history. That credibility extends beyond the geology and architecture, though. It’s always a cliché to say a game’s world is a living and breathing environment, but it’s the only phrase that can do San Andreas justice. Take a drive, go for a walk, or just stand still and the rest of the world will go by minding its own business. Roads will congest with traffic at peak times, dog owners walk their four-legged friends along Vespucci Beach, and brands such as iFruit and Lifeinvader prove to be as dominant a force in the lives of Los Santos’ residents as Apple and Facebook probably are in yours. Yep, there’s another Rockstar-flavoured social commentary here, and it’s good to know their trademark satirical sense of humour is still as strong as ever, with the returning fan favourite Weazel News reports once again providing some of the biggest laughs. Further adding to the illusion, and in the vein of Red Dead Redemption, are random encounters where some pedestrians will reach out for aid. 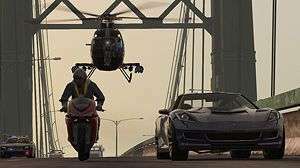 These can range from helping a dithering bride escape from her very expensive wedding to chasing after muggers who’ve stolen some poor soul’s wallet, car, or bike, to taking on the role of impromptu getaway driver for a vaguely-familiar face (keep your eyes and ears open for many knowing nods to GTA’s past). They happen irregularly enough to not become an annoyance, and each comes with its own dialogue and rewards, usually money, but sometimes it’ll add a name to your contact list who you may want to consider recruiting when it comes to planning GTA V’s headlining heists. Ah yes, the heists. GTA V’s excellent story revolving around three criminals united to pull off a series of daringly-dangerous heists is a cracking good one, and while some of the jobs may not be as large in scale, all of them make GTA IV’s Three Leaf Clover mission look like child’s play. There are six unique heists in total and each one requires a certain level of planning and prep work. First you have to choose your approach, which basically boils down to going in quiet and subtle, or big and loud. When put like that, it’s always easy to go for the former, but sometimes the more explosive and extravagant sound of the latter will get the better of you. And bear in mind that just because you went for quiet and subtle doesn’t mean it won’t still descend into chaos. Depending on the job, you’ll have to recruit some extra helpers. A roster of gunmen, drivers, and hackers will be presented to you and you’ll have to decide who you want to bring aboard. The more skilled the recruit the larger the cut they’ll want, but take a risk on someone cheaper and less capable and you could end up compromising the entire job, resulting in a smaller payoff than had you stuck with the professionals. Finally, you’ll have to gather any extra gear and equipment needed in order to pull off the job, such as disguises, or specific weapons, and also consider your getaway vehicle. When all the parts are in place, you can then experience six of the best missions that GTA V has to offer. Clearly, the heists are by far the highlights, but their excellence doesn’t come at the expense of the regular story missions or the Strangers and Freaks side quests. Far from it. Barely does one go by without there being some focal set-piece to keep it long in the mind, with every mission feeling equally as fresh as the last. Suffice it to say, the sections teased in the trailers are only the icing on the cake. 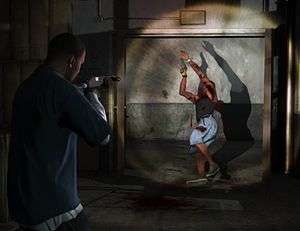 Films such as Heat, The Italian Job, and Terminator 2, and TV shows like Breaking Bad and The Wire have evidently had a strong influence on the story and mission design. Yes, there’s still a fair bit of driving to point A and shooting at point B, but the script, revamped driving and shooting mechanics, and ability to switch between the three protagonists means that it never grinds you down. Having three playable characters who you can freely switch between during the story was always the next logical step for Rockstar to take with GTA. It’s a concept whose roots can be traced back through L.A. Noire and Red Dead, all the way to GTA IV’s intertwining saga between Niko Bellic, The Lost and Damned’s Johnny Klebitz and The Ballad of Gay Tony’s Luis Lopez. Anyone who thought it wouldn’t work can rest easy as Rockstar pull it off with panache, both narratively and technically, and those who thought they had their favourite character locked down prior to playing will likely be reconsidering their choice once they’ve stepped into each of the protagonists’ shoes. First there’s Michael De Santa, a miserable middle-aged family man and retired bank robber who lives in a posh house in Rockford Hills (GTA V’s version of Beverly Hills) as part of a witness protection program thanks to his cooperation with the FIB. 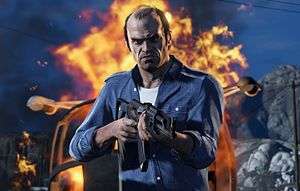 Next is Franklin Clinton, a repo man and car fanatic who’s the closest that GTA V has to a typical rags-to-riches protagonist. Then there’s Trevor Phillips, CEO of Trevor Phillips Enterprises/Trevor Phillips Industries/Trevor Phillips Corporation (it changes every time) who epitomises all the craziness of the GTA games of yesteryear. Along with their own subplots (Michael resolving his family issues, Franklin trying to make it big, and Trevor running his business) they also have their own specific skill sets and special abilities. Michael, for instance, has access to Max Payne-style bullet time, whereas Franklin possesses the driving equivalent, allowing him to take sharp corners and weave in and out of traffic without scratching the paintwork. Trevor, on the other hand, can activate a rage mode, dealing out double damage while only taking half. It’s a little gimmicky, sure, but during missions starring two or all three characters, switching between them and making effective use of their talents can sometimes be the only way to success, while also bringing to the table a new dynamic in the way you play. Multiple playable characters have allowed Rockstar to build missions and write a story that they never could before and the results are extraordinary. GTA can likely never go back to being about a single character ever again. The character switching itself is a simple affair. Holding ‘down’ brings up a radial menu on the bottom right corner of the screen and the right stick selects your chosen character. If they’re within close proximity, such as during a mission, the transition is almost instantaneous. Out of a mission, however, it takes a few more seconds, with the camera zooming out to a bird’s eye view, moving across the landscape to your chosen character’s whereabouts, and then zooming back down to terra firma, where you’ll discover that Michael, Franklin or Trevor have been getting on with their lives while you’ve been away. The switch takes a good few seconds to complete, something which only more horsepower can shorten but, considering the rest of the game is practically load-free, you can’t really complain. Barring the initial boot-up and a couple of pre-set moments in the story that understandably require a few seconds to load, GTA V is one giant seamless experience with only some light texture pop-in to slur its name. Everything is super polished, even by Rockstar’s standards. The cars, the guns, the cutscenes and animation… not a single area has been overlooked. Okay, so the shooting may not be able to compete with the very best genre specialists, but it cuts it mighty close. The cover-system feels snappy and responsive, and the guns are both loud and impactful. 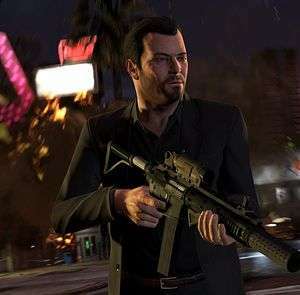 At some points, especially when playing as Michael, you could almost be forgiven for thinking you were playing Max Payne 3. It’s that good. As for the driving, bombing down Vinewood Boulevard in a Banshee, Cheetah, or Infernus invokes memories of playing one of Criterion’s Need for Speed titles. The more realistic and weighty physics of GTA IV’s vehicle handling have been toned down a tad and have merged with something that feels more akin to an arcade racer to strike the perfect middle ground. It may take a bit of getting used to, depending on how strong your muscle memory is from playing GTA IV, but there’s no denying that each of the 250+ vehicles – spanning boats, bikes, cars, planes, helicopters and submarines – feels completely different from the next. Take your chosen ride to one of the many garages scattered across the state and you can modify the brakes, suspension, engine, and even go so far as to adding bulletproof tyres (may come in handy for your getaway car) to make it utterly unique. While Saint’s Row still has the more expansive and over-the-top customisation options, here you can actually feel the difference that your purchases have made in the way that your vehicles handle rather than it simply boosting a stat metre. To top it all off, there’s also an impressive selection of customisation options for your weapons, as well as your characters’ appearance. Truly, the amount of depth in GTA V boggles the mind. Along with the sixty-nine story missions (the 69 gag strikes again), Strangers and Freaks side missions, and random events, as well as the chance to replay missions to complete challenges, re-attempt each of the heists choosing the previously non-selected approach, and see all three satisfying endings, you’ve also got optional racing, parachuting, hunting, golf, tennis, property management, stunt jumps, all sorts of collectibles and more to keep you going. Even if you ignore all of that though, there’s still fun to be had just cruising the roads and soaking up the sights. For all the praise towards the story, the characters and the missions, it’s always been – and likely always will be – GTA’s ability to create moments of magic when the game’s world and its systems collide that you’ll tell your friends about, and will recall more fondly than you would the biggest and best story missions. 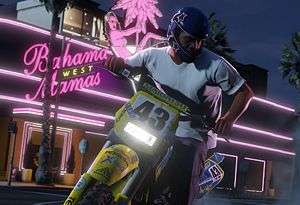 So, if it’s GTA V’s single player that will keep you coming back for months, then it’s the MMO-like Grand Theft Auto Online which will keep you coming back for years. 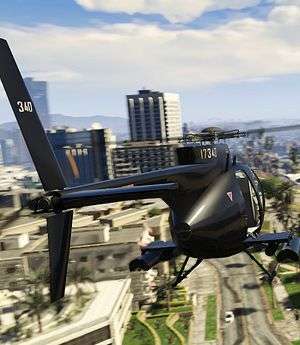 Granted, GTA Online hasn’t had the smoothest of starts in life but, launch issues aside, the chances to wreak havoc across San Andreas with up to fifteen other players however you see fit in free roam or good old-fashioned competitive multiplayer, pull off more heists, or even create your own missions in the mission editor are too good a proposition to pass up. GTA Online is being billed as its own thing, so who knows what plans Rockstar have in mind for the game’s future. We await with much anticipation. In the years since GTA IV we’ve had Saint’s Rows 2, 3 and 4, a second Just Cause and a new contender to the open world throne in Sleeping Dogs. Grand Theft Auto V laughs in all their faces, reminding us that, no matter how many try to compete, GTA has always been in a league of its own, not just in the open world genre but in gaming as a whole. There’s absolutely no reason why you shouldn’t play GTA V, not even to wait for the inevitable PC (and almost-guaranteed next-gen) version. Believe the hype: this is as good as gaming gets. Well, until GTA VI that is.